Babbling Brooke: Nail Polish Emergency! Advice? My cats knocked a box of nail polish off my desk and one broke - and of course it has to be black. What can I do? Has anyone dealt with this before? haven't tried it myself but i heard windex works... don't know why, don't know how! I have used tiny scissors and very carefully trimmed the dried polish off the carpet. It's tedious and you have to trim really close to the line where the polish meets the carpet. I did this once in High School and no one in my family noticed! I hope the Windex idea works. That sounds easier! Oh dear, is that on carpet? When I spilled nail polish on my carpet decades ago, my parents ended up needing to cut out the patch where the polish was and replace it. =( Thankfully luck has been on my side in that regard since I've grown up. Try to use as little liquid as possible to clean it up or you may get staining in the area. maybe try soaking the spot with acetone? I've never broken a polish on carpet so this is just my best guess. good luck! 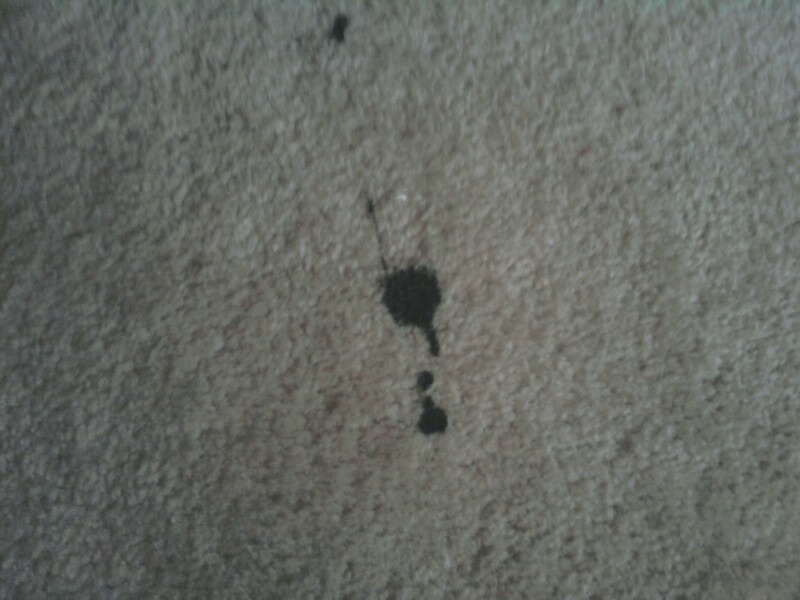 I've spilt nail polish on my carpet before and I tried to clean it up with polish remover and water. It didn't get rid of all the color though so I ended up snipping off some of the carpet. Good luck! I'm web surfing, trying to find answers, and this answer seems to be best. Acetone or nail polish remover might melt your carpet, but you're going to have to get in and break down the polish to get it out/off of the carpet fibers. Brushes or pumice might help break down the polish. Oh, no!!! Of course it's black - it wouldn't have happened otherwise. *sigh* I was going to suggest the same as paintedladyfingers (scissors). It's a pain and it takes a while, but it works pretty good. Good luck! AW! thats horrible. I did the same thing the other day actually but with a dark brown eyeshadow(rich pigmented) on champagne colour carpets. It was a mess. I used makeup remover and stain remover. Nail polish though! yikes! I would say soak with nail polish remover. and then snip off what doesn't come off with scissors. I've read that windex works wonders! In my experience acetone or non-acetone just smears the color all over. 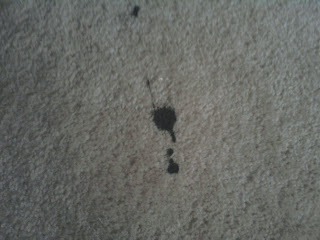 Yes, I got some of it up but so much of it just got diluted and spread about the carpet. And I spent hours and hours. On my next spill (which hopefully will never happen) I'm going to let it dry, then carefully try to cut the top fibers of the carpet off. I'm in a rental apt. If I owned this place I would cut out the carpet and patch a new piece in. Best wishes to you! Let us know how it goes. I once got polish on a pair of khaki pants and a combination of Windex and Off! bug spray and a lot of scrubbing with a toothbrush did wonders. I definitely do not suggest using acetone or polish remover, though. It'll melt the fibers in the carpet, which will just make your problems even worse. Sorry about your bad luck, and I hope something works to get it out! I recommend using aerosol hairspray, and scrubbing with a toothbrush. Just make sure to be really careful! The polish can seep and stain the surrounding carpet. Oh no!!! One of my worst fears!! I'm taking notes for preventive measures. Do come back and let us know what works for you, Brooke. I have kids so you know I've had to do this a few times. Use a white cloth soaked with polish remover and start blotting. Blot and rub in tiny circles. It takes a little work but I've gotten blue np out of my white carpet. Hope we can find an answer-I dropped a box of nail polish in my daughter's room on light beige carpet-broke 3 bottles of dark blue-what a mess! Acetone didn't work. Grrr-it was my fault, and now I will end up replacing the carpet! well I've had the whole bathroom wall painted bright red. thanks to my sister that bumped over the bottle. we threw a bottle of remover on the wall and started rubbing. there's still a bit of red left between the tiles but it doens't really show anymore. i would have put a lot of remover on the spot and hoped it would go away. Lots of remover at first. Paint thinner works well. Best thing to do is get it right away BEFORE it dries. I have done this too and I don't recommend the acetone - it took out some of the carpet colour as well! Since it's a small spot - one of those metal combs that you use to brush your cat works well and then you carefully cut out any nail polish that is stained into the carpet! HTH! Polish remover doesn't work nor does anything else I've tried. I would say snipping the polished soaked tips of the carpet would be the way to go. I've done it before and it really isn't noticable. This happened to me but in drops, so I literally took some clippers and started to snip the tips of the carpet, i basically gave the carpet of hair cute and cut out the dried polish.